In tribute to Leiber, the theme song for his life story. He was a sweet cat, but he wasn’t the brightest. For those who tuned in late, your humble gallery operator once used to be a pro writer. 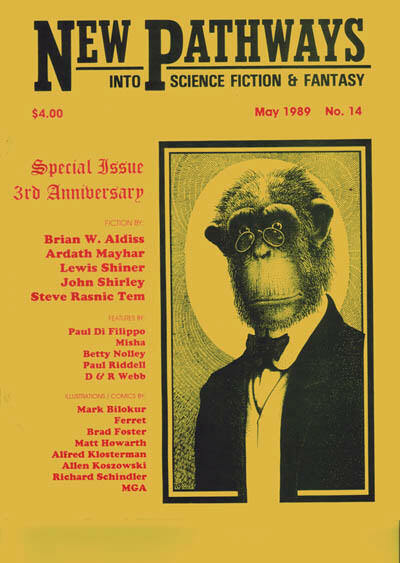 Thirty years ago this month, my first published article appeared in the pages of the long-defunct science fiction zine New Pathways, and that continued for another 13 years. Ten years ago this month, the first collection from that wild period, Greasing the Pan, saw print. After that, aside from a few relapses, bupkis. It was a very easy decision to stay away, if not for much-missed friends and cohorts who kept assuming that I’d come back “any day now.” I may write occasionally on subjects of particular passion, but I’m not going back to being a writer, and I’ve had to excise a lot of people, all of whom assume that the calendar will flip back to 1997 any day now, who refuse to understand the difference. And now the latest relapse: a discussion on sorcerers’ gardens and on running magical nurseries as a business, in the March 2019 Clarkesworld. Most of this was due to wanting to explore certain tropes in fantasy literature with a high potential for humor (let’s face it: “Johnny Pink Bunkadooseed” would make a great story), and part of it was due to the reputation of nonfiction editor Kate Baker. This isn’t the only planned relapse: I’m currently composing a similar take on unorthodox carnivorous plant tropes for the April issue. Just don’t expect a return to pro writing, because the gallery and its care is a lot more important. In the meantime, feel free to spread this far and wide, because I can’t wait to read the stories and novels running with the concepts therein. And because every idea thief needs to leave his knife, this wouldn’t have happened without the influence of Tobias Buckell, Saladin Ahmed, and the crimefighting team of Ernest Hogan and Emily Devenport. Always give credit to friends: always. Don’t forget: feeding hamburger to your Venus flytrap is a bad idea.